Fondue is a dish of melted cheese served in a communal pot or Fondue pot. Cheese Fondue refers to melted Cheese, usually served with dry bread and vegetable. There are many interesting stories behind the origin of this dish. That some residents in Alpes area has run out of their food, yet the dry bread and cheese with unpleasant smell was left. 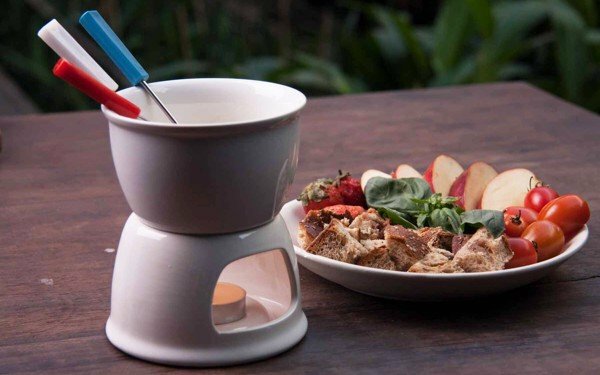 This came to an idea of melting the Cheese and dipping the dry bread in order to make the bread easier to digest. Surprisingly, they are really a great combination which finally comes to a name: Cheese Fondue. Nowsaday, depends on the area, some recipes are added Wine, Garlic and so on, to make the dish more delicious and appealling. 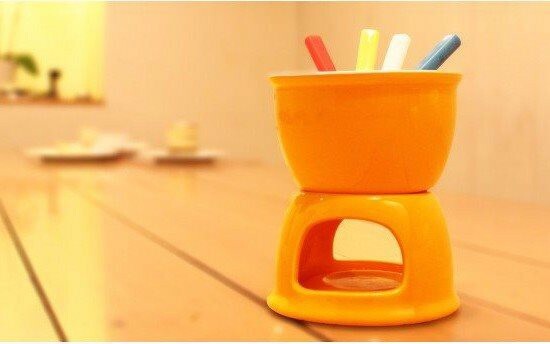 Ingredients: Fondue Pot (4 Forks + 4 Candles) *Please note that the pot color can be varied compared to the picture.